There is a city in Southern Iran close to the Iraqi border called Ahvaz. That city is close to the ancient city of Shush. And not far from Shush lies the Haft Tappeh Sugar Cane Factory Complex. On a Sunday mid-November 2018, a young woman of 23 years old with short blue hair left Ahvaz together with a girlfriend and drove for several hours to Shush in order to support the ongoing and growing protests by the Haft Tappeh workers and to report as a citizen journalist from the scene. This woman is Sepideh Gholian. The lives of Sepideh and Esmail will from then on be connected, as they could have never imagined. This girl with the blue hair started documenting the protests, sending photos and videos to different media outlets and posting them on social media. Sepideh sent her reports from the scene directly to outside journalists who shared them widely on the Internet and social media. And so did Zamaneh. This story soon turns into a tragic one. One where both Esmail and Sepideh are arrested, among many others, but the two of them had to endure the most. They have been tortured, their families harassed and beaten and after speaking out about these events of their torture and forced televised confessions after being released, they have both been arrested a second time and they are both in prison right now. After being released Sepideh actually recorded her interrogator who threatened her and shared the files with the media. 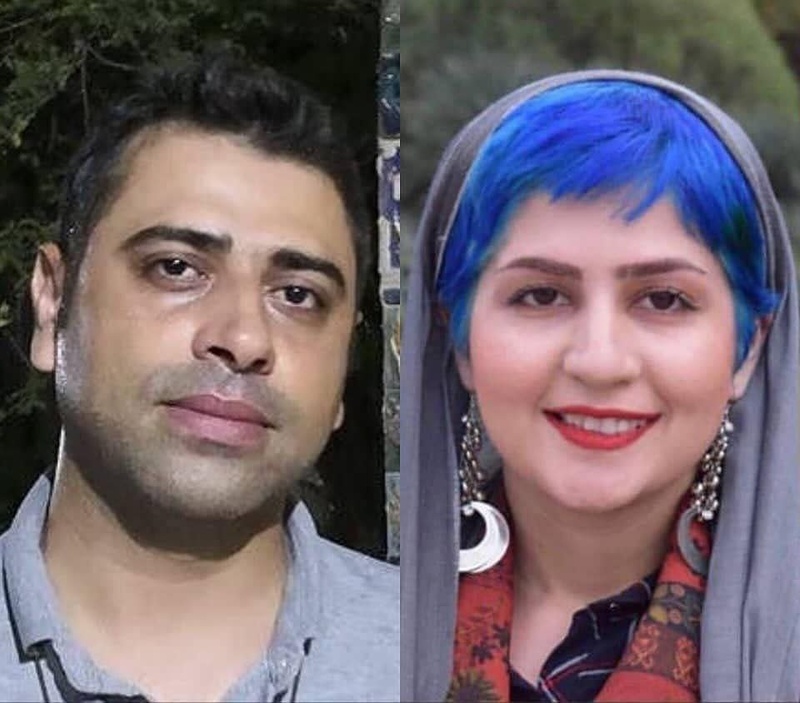 Esmail published an open letter on social media after his first arrest and release, attesting to being tortured while in custody which Sepideh confirmed as having witnessed. This triggered widespread support and outrage and led to revelations from numerous Iranian political prisoners publicizing their own accounts of abuse and torture in Iran’s prisons. All along the Iranian authorities (the ministry of intelligence and the judiciary in Iran) have denied the allegations of torture in Iran’s prisons. They claim that these statements are part of a plan conceived by foreign enemies. Why is this story the one I choose to speak about when discussing independent media and the future of Iran? The workers’ rights protests happening all over the country every single day. These protests are protests of the working class who are enduring tremendous economic hardships throughout many sectors and geographical regions and we anticipate that they will eventually all be connected together. The emerging class, like Sepideh, of what we call the Middle Class Poor: a growing group of young, highly educated, unemployed individuals with access to technology and the internet, lots of time on their hands and with a cause. The cause of simply trying to achieve a better future for themselves. We believe that this group can be a driving force of sociopolitical change. They have demands and they want to be agents of change. For years the question of media outside of Iran has been how to access the civil movements that are shaping in the field domestically in Iran. Social media, the internet and technology have often been over-glorified as tools of social movements. But access to the field is vital to make change possible. It is people like Sepideh that are connecting us, the media, to the field. She shines, where technology fails us. She is the one with access to technology and media outlets and can share the stories and the voices of the protesting workers who did not have that access. She connects the field to the rest of the world. It is the connection between a movement happening online, and a movement happening on the ground. It is contributors like her that help us at Zamaneh, collect and report on many labor protests throughout the country even in the most remote places, which we cover in in-depth bi-monthly labor rights reports that we produce in Farsi and English. Those reports then end up as publications on our news website reaching millions of people inside Iran. So my message really is: technology is not what makes social movements, it is people that make social movements happen and these are the tools that they have. It is these brave individuals who make the access and the connections happen. Through these tools that groups like Psiphon and others provide us with, vital information and connections can be made and shared. Unfortunately this young woman is paying a very, very high price for doing this. It is people like her that we must support and invest in, as well as the editorial teams that break and cover these stories. I would like to ask of you, is it okay that a technologist charges 150 dollars an hour and a journalist 25? We need to support journalism just as much. What can we do at Zamaneh? We can share their stories; we facilitate and moderate a citizen reporting website; a secure leaking portal and whistle blowing platform is in the making; we just launched Iran’s first petition platform Dadkhast; and we try to find the themes that are relevant to the people and try to engage with them on the online platforms that they are able to use. To have a peaceful and locally driven transition towards a more democratic and rights-based society in Iran where access to information and freedom of expression are no longer censured and punished, the media need access to these people in the field to tell their stories, and they need to have access to independent media to increase their knowledge, to be empowered and informed. Please consider supporting Zamaneh Media with a small donation. Find out more about supporting Zamaneh Media financially on our donation page. You may also consider advertising with us. Please visit “Advertise with us” to find out about the possibilities.